Let your true personally shine bright and pick up a pair of GloFX Round Retro Diffraction Glasses. Designed with the purest style and comfort in mind, these glasses will outperform any competitor. Featuring a unique circular frame design, our Retro Diffraction glasses are sure to be a hit with all your friends. Having hard plastic lenses and a very high quality craftsmanship, these diffraction glasses are sure to stand the test of time, while still offering you the most amount of diffraction! Keep your peace of mind with our GloFX Lifetime Limited Warranty and you won’t have to worry about your Round Retro Diffraction Glasses ever, we have you covered! The light diffraction effect of our Windsor styled Round Retro Diffraction Glasses is directly infused into the hard Plexi-Plastic lenses. This laser etching process makes for supreme light diffraction that presents a clean and even effect from edge to edge. Try these glasses on and see three times the traditional light diffraction effect. 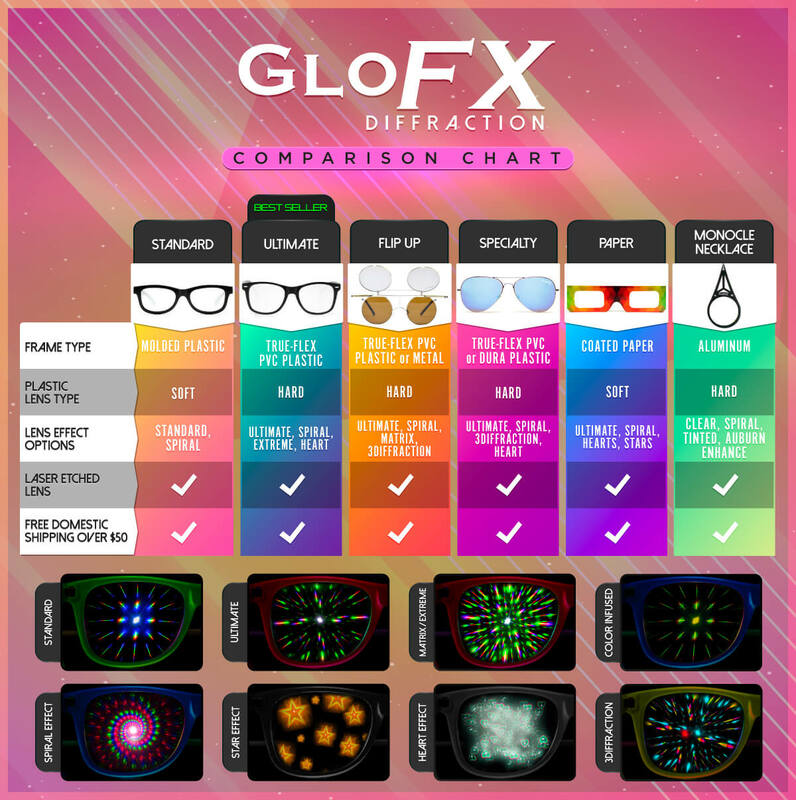 Make the right decision and purchase a pair of GloFX Round Retro Diffraction Glasses today! They work great and I love the style! They’re pretty durable and they came with extra paper ones and a bracelet.